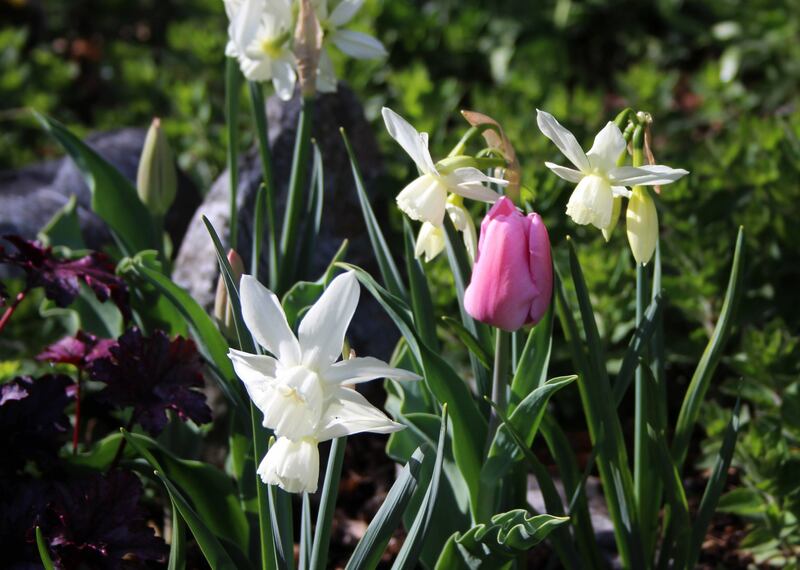 What’s delighting you in your garden today? Your view looks happy to me in both images. Glad you happily received rain. I hope we get a break from it for a few days. It’s been too wet to get out into the garden. 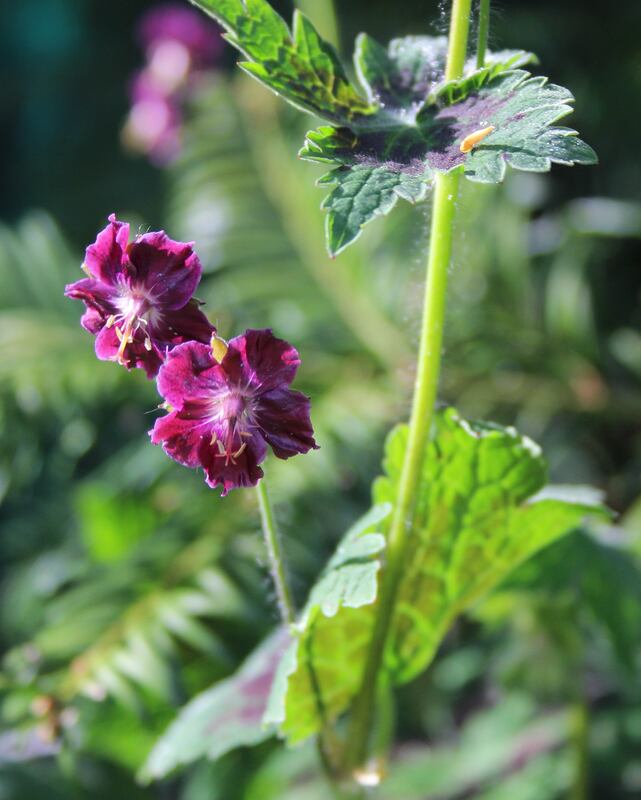 The Geranium phaeum has a pretty color. 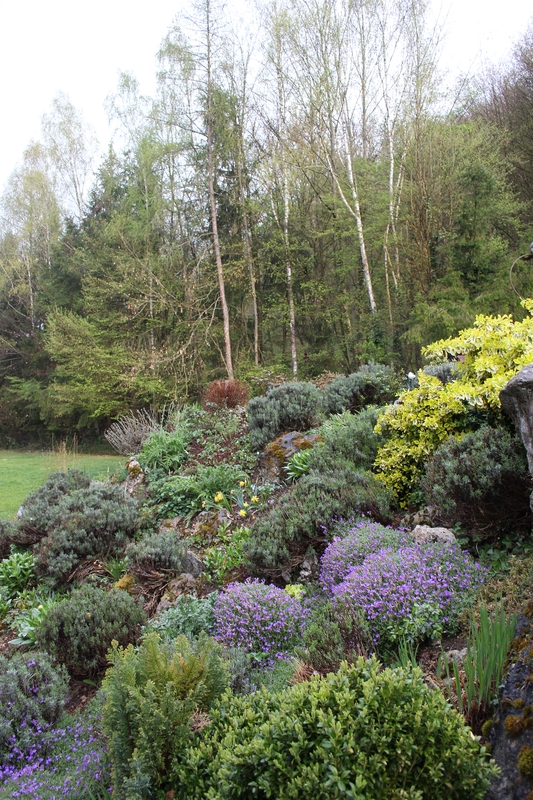 Garden is looking wonderful – so fresh and vibrant. I admit to liking snails too. except in the veg patch! I have a love-hate relationship with them too. We get so many lovely colours and sizes here. 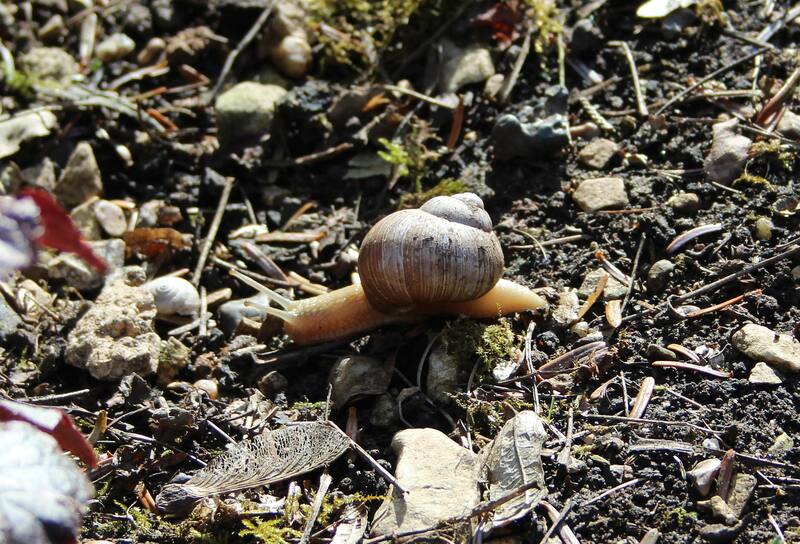 Apparently snails help keep the slug population down too, but in a wet year the snails can do as much damage! The crocus, as you probably know. It’s always such a relief to get rain after a dry spell. The garden is visibly grateful for the rain Jason. Hope we get a drop more though! I’m so glad it rained finally!!! Everything looks so green, vibrant and fresh. Me too! The trees on the hills here are slowly turning all shades of green. Quite a picture! I did not know snails help keep down the slug population, we have both and they are taken in a bucket to the field behind our garden, where I hope they stay. Is your geranium is flowering early, nothing doing here yet, just leaves. The view looks green and lush even though you haven’t had enough rain, hope you do get some more. Hi Julie. Apparently snails eat slug larvae. I think it may be true as we have so many snails and rarely slugs. I have never even tried removing them as it would be fighting a losing battle with the woods right next door! The geranium is an early flowering one and looks best in spring, although it does keep on flowering most of the year too unless very hot and dry. It self-seeds well but can easily be pulled up if it starts taking over! This year we are several weeks ahead, so it wouldn’t normally appear here until late April or even May. I am curious, how many hours a week do you spend in the gardens? To create what you’ve created must have been a labor of love! Not enough time Bonnie! I would love to be out there all the time, but it gets fitted in around other commitments and the weather! 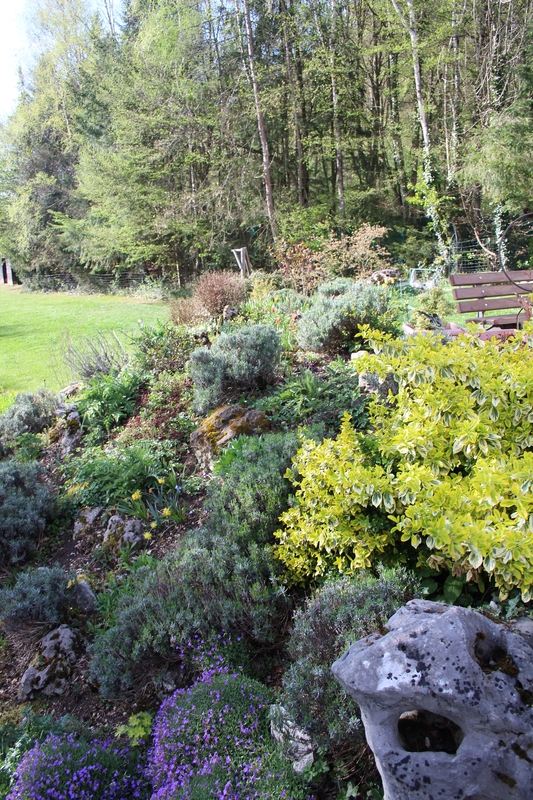 Seriously, it is a very low-maintenance garden, and requires most work late spring (weeding) or late summer (cutting back). Everything is greening up and filling out a lot compared even to last Tuesday’s view. It is interesting how quickly it all seems to happen; one minute there is lots of bare soil then suddenly it is all covered with plants. Like your very smart black labels. Thanks Cathy but I’m not sure I need labels in my borders. April- weather 🙂 sun and rain. I like your white and red-shaded blossoms. We have a lunaria flowering in the wood in front of our house. 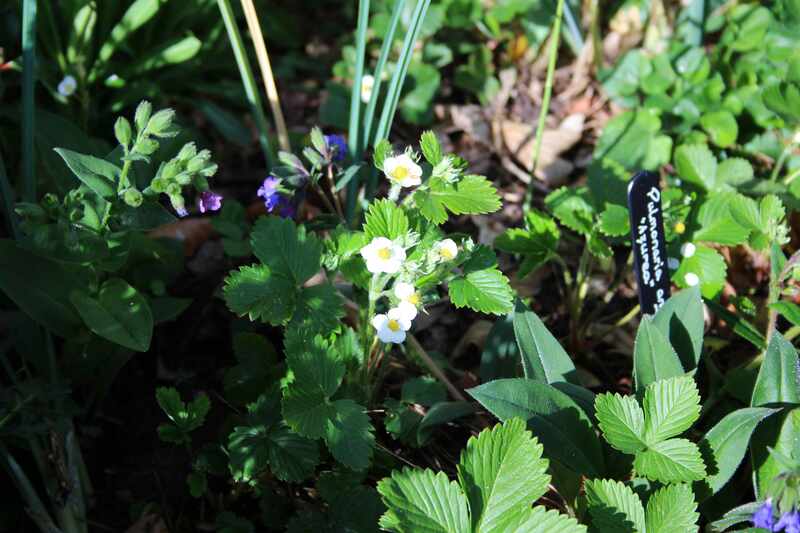 … and strawberries are flowering after a plastic-shelter (my father idea). Hi Uta. It is a bit of a shock to feel the cold wind after such warm days last week! You have reminded me to look out for the Lunaria – some in the woods and one in my garden. I know you and your garden were thrilled to have the nourishing rain. Yes, but we are still thirsty! 😉 After so many weeks with barely a drop, and now strong winds, I will be watering at the weekend I fear…. in April! Goodness, its really filling out now isn’t it. I missed out on “Thalia” when I ordered my buls, I was too late and they had sold out, but it is definitely on the list. Love the G. phaeum. 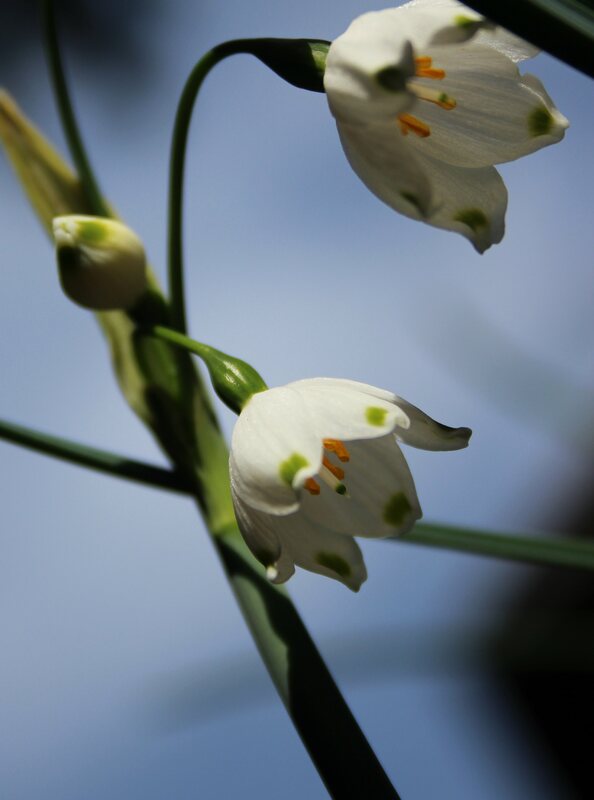 And I was doubtful about white daffodils but I now think they are my favourites! Hope you find some for this autumn’s planting. The G phaeum is gorgeous in spring but gets a bit vigorous and spreads like mad! What a lovely view of the garden, it’s looking beautiful. Thanks Chloris! A little more rain overnight has made it look even greener today! 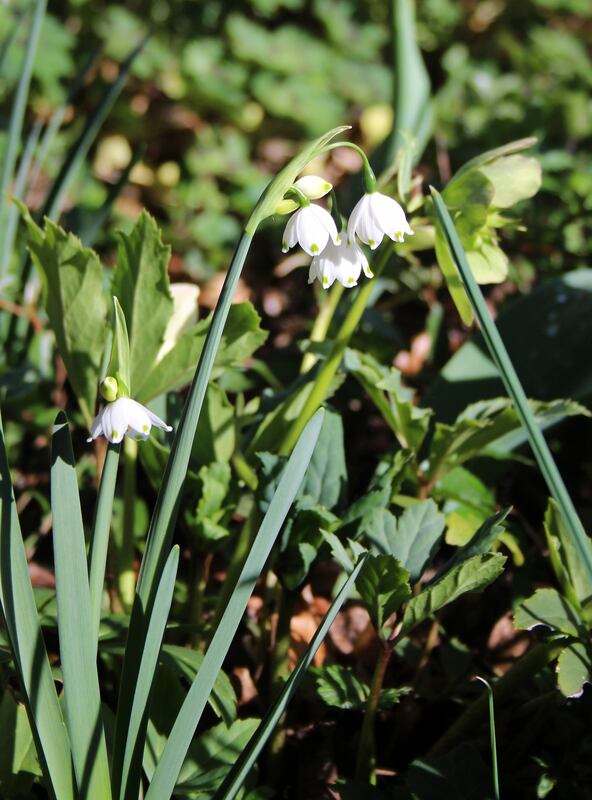 I am very impressed with these tall ones as they really stand out after the snowdrops are well over. The blossom in our neighbours’ gardens was short-lived due to last week’s heat, but it is much cooler now. We have typical April weather. Thanks Nancy. This little snail must have been pretty hungry after all the dry weather we had! I admit to being thrilled even hearing about rain! I’m sure that beautiful garden of your just thrives with each drink! I love each flower and plant, but I am particularly enamored with the little snowflakes. They are just so sweet! Right now I’m loving the early roses and the iris. The iris won’t be blooming much longer as the weather warms up. This is when they just delight me. 🙂 Your garden is gorgeous, Cathy! Great to see so much blooming.